The Poland market for facilities management is highly fragmented and competitive in nature, thanks to the presence of a large number of players operating in the market, states a new market research study by Transparency Market Research. Some of the key players in the market are Sodexo, Inc., Impel Tech Solutions, Bilfinger HSG Facility Management GmbH, and Cushman & Wakefield. The leading players in the market are focusing on innovations and research and development activities, which are predicted to accelerate the overall growth of the market in the next few years. In addition to this, the expansion of the product portfolio is another key factor that is likely to enhance the competition of the Poland facilities management market throughout the forecast period. According to the market research study by Transparency Market Research, in 2015, the Poland market for facilities management was worth US$14.34 bn. The market is likely to reach a value of US$32.62 bn by the end of 2024, registering a promising 9.70% CAGR between 2016 and 2023. 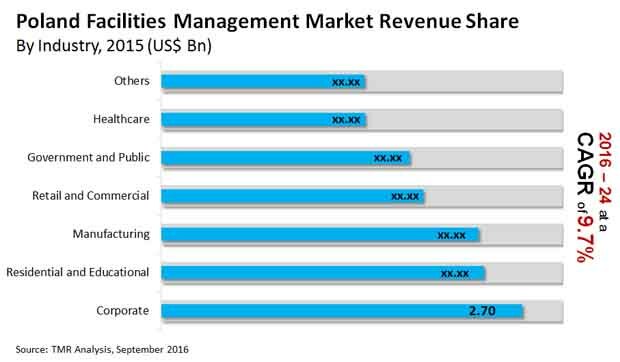 The Poland market for facilities management has been classified on the basis of end use and among the key segments, the corporate sector is expected to account for a large share of the overall market throughout the forecast period. As per the study, this segment is likely to register a healthy growth rate in the coming few years. The rising demand for facilities management in the corporate sector is one of the key factors expected to encourage the growth of the overall market in the coming few years. Furthermore, the retail segment is likely to remain in the second position in terms of market share. The Poland market for facilities management has been classified on the basis of service type into soft services and hard services. The soft services segment is projected to lead the Poland market throughout the forecast period and is likely to remain in the similar position in the near future. According to the study, this segment is likely to account for more than half of the overall market in the next few years. A significant rise in the demand for outsourced services in order to manage and the rise in the production capacities are some of the key factors that are projected to encourage the growth of the overall market in the next few years. The growing adoption of outsourced facilities management services across the diverse industrial sectors is predicted to enhance the overall growth of the market in the next few years. In addition to this, a high number of businesses that are shifting towards facilities management services is projected to accelerate the growth of the Poland market in the next few years. A significant rise in labor costs is one of the key factors anticipated to restrict the growth of the Poland facilities management in the next few years. The lack of awareness regarding the advantages of effective management of facilities is another key factor likely to curtail the growth of the overall market in the coming few years. Nonetheless, the rising in the standardization of core services is predicted to accelerate the growth of the facilities management market in Poland throughout the forecast period. The lack of awareness regarding the benefits of effective facility management is projected to encourage the growth of the overall market in the coming years. The corporate sector is projected to witness high growth in the next few years and encourage the growth of the overall market in the near future.